Another Friday, another Duesenberg. This one is coming from Gooding & Company’s auction in Amelia Island, Florida. There are a number of sales that take place around the Amelia Island Concours show and they happen to be great places to buy and sell grand American classics like this. This is an SJ – a supercharged Model J. Many Model Js were supercharged later on in life, but this is one of 36 original factory supercharged examples. The 6.9-liter straight-eight puts out 320 horsepower in this form – an astounding number for 1934. Of those 36, only five have a closed body on them – with this one featuring a very road trip-worthy Touring Berline by Rollston. Can’t you just picture those roof rails (which were designed to hold 800 pounds of bags and trunks) loaded to the limits with luggage for a cross-continental voyage in the mid-30s? This car was delivered new to a wealthy socialite who took it on several European tours. The original purchase price was $18,000 in 1934. Wealthy indeed. Until recently this car was entirely original, retaining most of its original paint – but the car has been repainted in the past two years. Hopefully the rest of the car remains as it was. It is expected to bring between $950,000-$1,400,000. Click here for more info and here for more from Gooding & Company in Amelia Island. 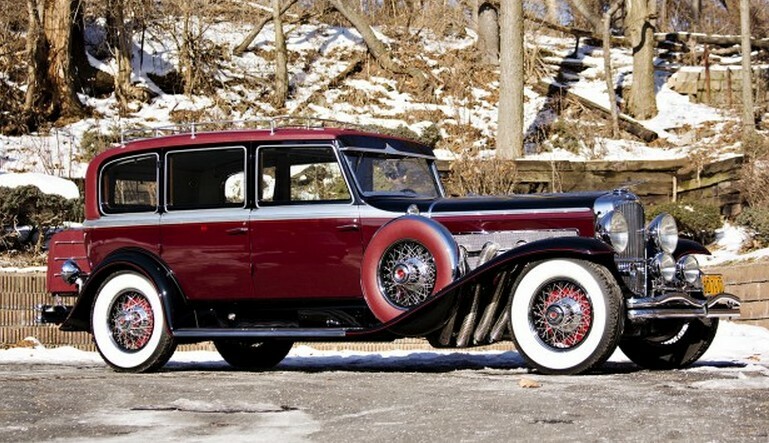 This entry was posted in Uncategorized and tagged 1934, auctions, cars, classic cars, duesenberg, gooding & co, j-514, model J, model sj, rollston, sj-514, touring berline by classiccarweekly. Bookmark the permalink.